Jessie Mann is an artist from Potomac, Maryland who specializes in designing and painting Limoges Boxes. Jessie has been practicing this lost art for 38 years. Recently, Jessie has expanded to include in her repertoire English Enameled Boxes. 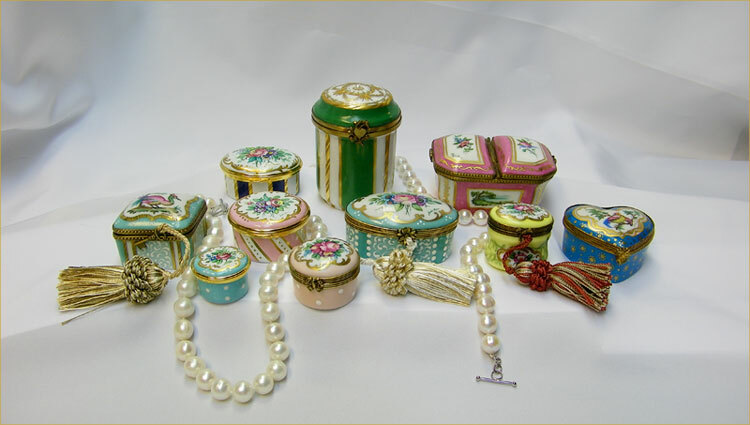 Jessie orders blank Limoges porcelain boxes from Limoges, France and blank English Enamel boxes from Staffordshire, England. Each box is custom painted using the finest paints with luch, rich colors. The boxes are adorned with raised French enamels and 24 kt gold guilding and etching. Connoisseurs and collectors from around the world have been acquiring Jessie's boxes for years.